Bob Dylan and Johnny Cash had been circling each other for the better part of a decade before finally joining forces in the studio. The Man In Black had made the first move, writing the young troubadour a fan letter shortly after Dylan came on the scene in 1962. When they met in person at the Newport Folk Festival two years later, he gave Dylan one of his guitars as a sign of respect. 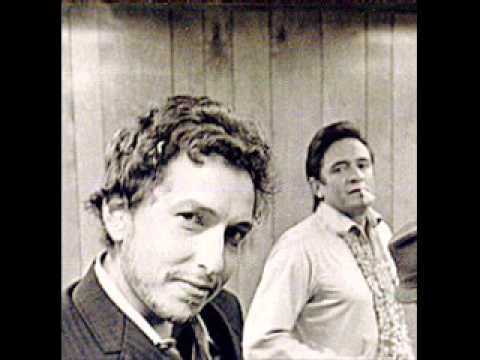 In February 1969, Dylan was in Cash’s hometown recording his ninth album, the country-imbued “Nashville Skyline”. By chance, Johnny Cash happened to be working in the studio next door. Dylan paid him a visit, and on February 17th and 18th, the pair recorded more than a dozen duets together. Of the bunch, only one of them – an update of the Freewheelin’ Bob Dylan track “Girl From the North Country” – made the finished album. The rest would languish in the tape vaults until being liberated by enterprising bootleggers. 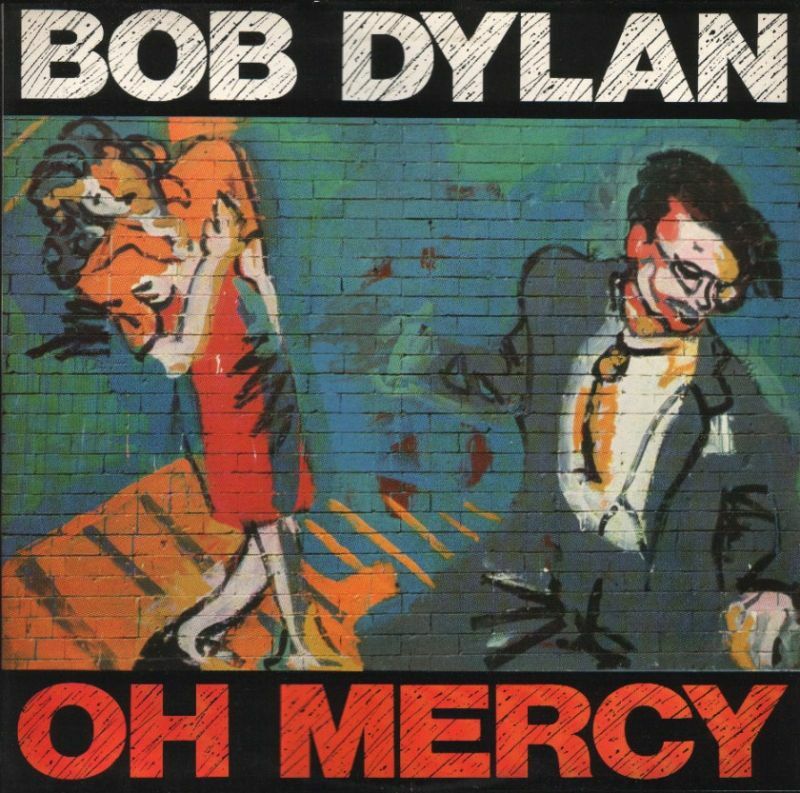 Oh Mercy is the 26th studio album by American singer-songwriter Bob Dylan, released in September 1989 by Columbia Records. Produced by Daniel Lanois, it was hailed by critics as a triumph for Dylan, after a string of weaker-reviewed albums. When Dylan went recording Oh Mercy, his career was at a low-point after two poorly received albums (Knocked Out Loaded and Down In The Groove), and the feeling he lost his spark, according to his own memoir Chronicles Volume One. Bob himself thought he lost his voice back in 1987. Oh Mercy gave Dylan his best chart showing in years. Standout tracks: ‘Where Teardrops Fall’, ‘Ring Them Bells’, ‘Most of the Time’, ‘What Was It You Wanted?’ Tracks recorded but not selected: ‘Dignity’ and ‘Series of Dreams’. One of Dylan’s most ambitious compositions, “Series of Dreams” is given a tumultuous production from Daniel Lanois. The lyrics are fairly straightforward, giving a literal description of the turmoil encountered by the narrator during a “Series of Dreams.” However, the descriptions quickly unfold into a set of highly evocative verses. Another outtake, “Dignity“, was one of the first songs written for Oh Mercy. Dylan viewed “Dignity” as a strong contender for the album, and an extensive amount of work was done on it. However, Dylan was dissatisfied with the recorded results, resulting in his decision to omit it. 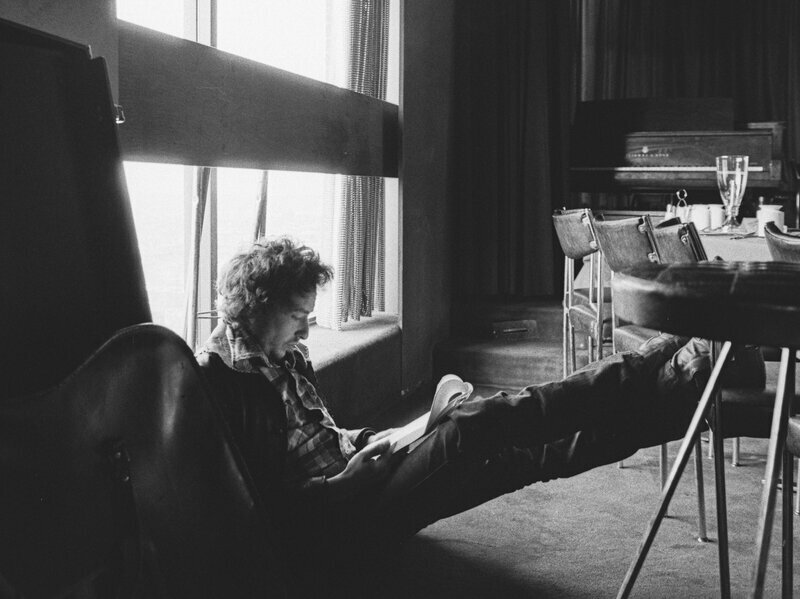 The two most celebrated outtakes fromOh Mercy’s sessions, Dylan would not only perform “Dignity” and “Series of Dreams” live, he would eventually release them. “Series of Dreams” was the final track on The Bootleg Series Volumes 1–3 (Rare & Unreleased) 1961–1991, and it was later included on 1994’s Bob Dylan’s Greatest Hits Volume 3. “Dignity” was performed live during a 1994 appearance on MTV Unplugged, and the same performance was later issued on the accompanying album. A remixed version of “Dignity” featuring new overdubs was released on Bob Dylan’s Greatest Hits Volume 3, while the original Lanois production would not see release until the soundtrack album of the television show, Touched by an Angel. Two more outtakes, “Born In Time” and “God Knows“, were set aside and later re-written and re-recorded for Dylan’s next album, Under the Red Sky. Versions of both songs from the Oh Mercy sessions were also included on The Bootleg Series Vol. 8: Tell Tale Signs. “The Oh Mercy outtake of ‘Born In Time’ was one of those Dylan performances that so surrendered itself to the moment that to decry the lyrical slips would be to mock sincerity itself”, wrote an enamored Heylin. The songs were haunting, the songwriting excellent and it proved Dylan wasn’t done yet and relaunched his career. It thusly culminated with the success of his turn of the millenium albums, Time Out Of Mind, Love & Theft, and Modern Times. However, although Oh Mercy is a great album, some outtakes are better than the songs who made the cut. This is also the last albums where you can find several outtakes from the sessions only on bootlegs as for now. The sound is crisp, the performances intense, and Lanois production, although echoey, truly matches the songs. Oh Mercy can perhaps best be thought of as a collaboration between Dylan and producer Daniel Lanois. Lanois, who most recently produced the Neville Brothers’ extraordinary album Yellow Moon, hooked Dylan up with members of the Nevilles’ band — guitarist Brian Stoltz, bassist Tony Hall, drummer Willie Green and percussionist Cyril Neville — and fashioned evocative, atmospheric soundscapes that elicit every nuance of meaning from Dylan’s songs while never overwhelming them. Dylan’s lyric style on Oh Mercy — a plain-spoken directness with rich folkloric and Biblical shadings — finds an ideal setting in the dark, open textures of Lanois’s sonic weave. The album opens with “Political World”, a song that Dylan described in Chronicles Volume One as a “catalog of troubles…almost an update on ‘With God on Our Side. '” A cranky tirade against the modern world, it begins with the verse, “We live in a political world/Love don’t have any place/We live in a time where men commit crime/And crime don’t have a face”, which leaves one to argue, which age does this not apply to?. “Ring Them Bells” may be the only song on the album that was released with its live vocals intact. “One of my favorites is ‘Man in the Long Black Coat,’ which was written in the studio, and recorded in one take”, recalls Lanois. Praised by author Clinton Heylin as a “powerful reinterpretation of The Daemon Lover motif”, “Man in the Long Black Coat” also contains some prominent use of apocalyptic imagery, evoking a place where the “water is high” and “tree trunks uprooted”. In his own assessment of “Man in the Long Black Coat”, Dylan wrote that “in some kind of weird way, I thought of it as my ‘I Walk the Line,’ a song I’d always considered to be up there at the top, one of the most mysterious and revolutionary of all time, a song that makes an attack on your most vulnerable spots, sharp words from a master”. The second half of Oh Mercy is notable for its sustained moodiness and resignation, often in relation to romantic dissolution. This is immediately apparent on the atmospheric “Most of the Time”, which features the richest production on the album. the narrator in “Most of the Time” sings of an estranged lover whom the narrator can’t quite shake from his memories. The song addresses an irreconcilable, personal relationship, and this theme would continue through “What Good Am I?”, a frank look at the narrator’s moral worth, and “What Was It You Wanted”. Though he is still uncertain of its origins, in his autobiography Dylan does write that “Disease of Conceit” may have been inspired by the defrocking of Jimmy Swaggart. Lou Reed selected this song as one of his ‘picks of 1989’. The album closes with “Shooting Star”. While recovering from a hand injury in December 1987, Dylan wrote “Political World”, his first new song in a long time. According to his autobiography, the lyrics for “Political World” came to him spontaneously and were easy to write; though no melody was composed, he came up with 20 verses. The onset of inspiration did not stop there. Days later (during the first week of 1988), he wrote verses for a second song, “What Good Am I?”, over the course of one evening. The next day, he wrote another called “Dignity”. Unlike his previous two songs, “Dignity” was written with the rhythm, tempo, and melody all in Dylan’s head. Completed over the course of an afternoon and evening, Dylan composed the song after hearing of Pete Maravich‘s death. Over the next month or so, Dylan composed many more songs (20 by his estimate), including “Everything Is Broken”, “Disease of Conceit”, and “What Was It You Wanted?” Melodies were written for only a few of them. In the meantime, Dylan’s injured hand was healing well; he was encouraged by his doctor to play guitar again. Dylan began playing concerts again soon after his recovery. While it would be unfair to compare ‘Oh Mercy’ to Dylan’s Sixties recordings, it sits well alongside his impressive body of work. Heylin countered this remark, arguing that the Oh Mercy sessions had the songs to compete with Dylan’s most celebrated work. A few of these songs were not issued on the album, but they soon found their way into private circulation where they acquired a strong reputation among critics and collectors. In 1989, Bob Dylan released Oh Mercy, his twenty-sixth studio album. Watch the official music video of “Most of the Time” now. Fresh off a two-record stint with Asylum, Bob Dylan returned to Columbia Records in 1975 with one of the most acclaimed records of his career. 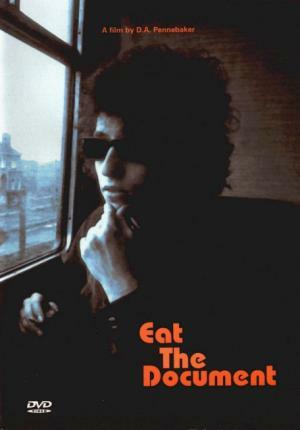 Blood on the Tracks found Dylan reinvigorating the “confessional” singer-songwriter genre, even as he repeatedly insisted that the album’s songs had no relation to his own life and then-recent marital turmoil. Whatever the truth, Blood on the Tracks was painfully raw, vulnerable, and altogether exquisite, boasting such all-time classic compositions as “Tangled Up in Blue,” “Simple Twist of Fate,” and “Shelter from the Storm.” The making of the album was anything but smooth, however – and now, the full story can be told on the fourteenth volume of Dylan’s long-running Bootleg Series. More Blood, More Tracks will be available on November 2nd as a 6-CD box set or 2-LP/1-CD highlights editions, chronicling the album’s original New York sessions and subsequent Minnesota rebirth via all of the extant session material including 75 previously unreleased tracks. Dylan began recording at New York’s A&R Studios with producer-engineer Phil Ramone on September 16th, 1974. The first group of musicians including Eric Weissberg and his band, Deliverance, only lasted a couple of days before the artist brought in Paul Griffin on organ and Buddy Cage on steel guitar. (Tony Brown was retained from Weissberg’s group.) After ten days and four sessions with this group, Dylan had assembled an entire 10-song album which Columbia took to the test pressing stage in November. But the restless Dylan had second thoughts. With a new set of musicians, he entered Minneapolis’ Sound 80 studios in December. In a couple of days, he re-recorded five of the ten songs, and the raw, stark, and powerful Blood on the Tracks as we know it was finished. Over the years, session material has trickled out. Only one of the five tracks from the test pressing, “You’re a Big Girl Now,” has ever been officially reissued. It appeared on the Biograph box set along with a version of the outtake “Up to Me.” Subsequently, The Bootleg Series Vols. 1-3featured New York alternate takes of “Tangled Up in Blue,” “Idiot Wind,” and “If You See Her, Say Hello.” “Call Letter Blues,” an embryonic version of “Meet Me in the Morning,” was also included on that set. An alternate of “Shelter from the Storm” was released on the Jerry Maguire soundtrack, and in 2012, an alternate “Meet Me in the Morning” appeared as the B-side of “Duquesne Whistle” on a Record Store Day single. That left “Lily, Rosemary, and the Jack of Hearts” as the only song from the New York sessions which had not been released in any take. The Bootleg Series Vol. 14: More Blood, More Tracks arrives from Columbia/Legacy on November 2nd. The earlier album sessions that went down in New York City left many more demos and alternate versions on the cutting room than most anyone outside the innermost Dylan camp imagined. Disc 1 consists entirely of Dylan alone in the studio, accompanying himself on guitar and harmonica, at the very beginning of the process. None of these appeared on the original album. 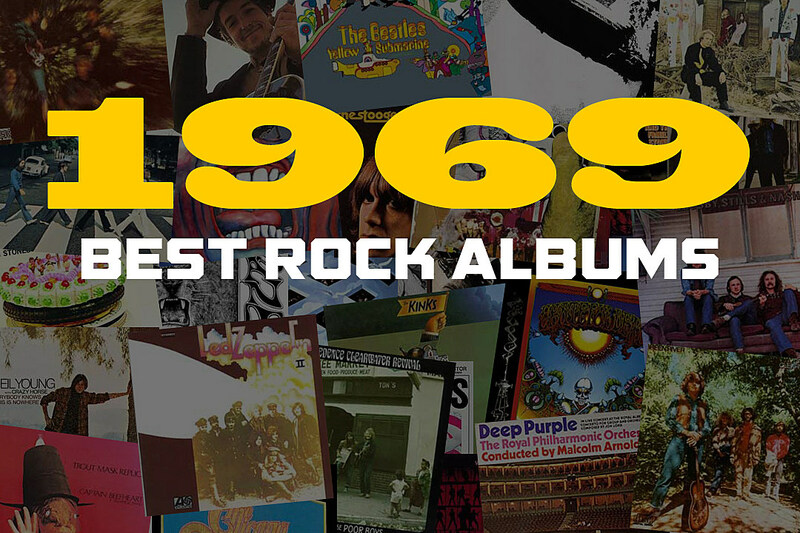 The second disc is made up of Dylan’s initial band sessions with the group Eric Weissberg & Deliverance, whom he quickly grew dissatisfied with and replaced. Only one of those made the finished album. It’s these two discs that may represent the greatest treasure trove for serious fans. But the remaining four discs are hardly fool’s gold themselves. Disc 3 finds him continuing to work in New York with a mostly different band that was more to his liking and produced more of the eventual album. On Discs 4 and 5 and the first part of Disc 6, he ditches that band and performs the songs solo once again, or with just a bass player, ending the New York portion of the proceedings as intimately as they started, in the creation of what many consider his most intimate album. 42 years ago today (9/13/76), Bob Dylan released his true to late 70’s form live album Hard Rain. The album was recorded during the second leg of the Rolling Thunder Revue and was partly recorded on May 23rd, 1976, during a concert at Hughes Stadium in Fort Collins, Colorado. The concert was also filmed and later broadcast by NBC as a one-hour television special in September. The Rolling Thunder tour is most distinguishable by the white face paint Dylan wore and that he chose to play a series of small venues with a revolving cast of musicians that included Joan Baez, Ramblin’ Jack Elliott and Roger McGuinn. Watch Dylan perform “One More Cup of Coffee” from the Rolling Thunder Revue tour live in ’75. In pouring rain, Bob Dylan plays the open air Hughes Stadium at Colorado State University in Fort Collins. He has elected to film this show to replace the aborted TV special from Clearwater. In the longest set of the tour, there are several highlights, not all appearing in the TV special. … Included in the TV special, although in a most peculiar order, are second encore “A Hard Rain’s a-Gonna Fall,” the entire Dylan/Baez set (“Blowin’ in the Wind,” “Railroad Boy,” “Deportees,” and “I Pity the Poor Immigrant”); three songs from the first set (“Maggie’s Farm,” “One Too Many Mornings,” and “Mozambique”); and three from the last set (two tremendously powerful readings of songs from Blood on the Tracks, “Idiot Wind” and “Shelter from the Storm” and a faded “Knockin’ on Heaven’s Door”). Despite the storm clouds raging, the crowd appears to be very enthusiastic, even singing “Happy Birthday” for Dylan before the second encore. 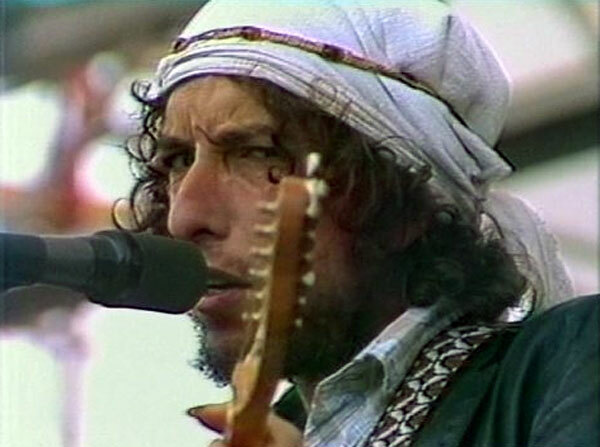 Bob Dylan’s Gospel years inspired and rankled in unequal measure – with the critical brickbats and audience boos often drowning out the strength and beauty of the impassioned musical ministries delivered by Dylan between 1979 and 1981, gathering around him his five-strong chorus of gospel singers, and a crack band that included Little Feet guitarist Fred Tackett, bassist Tim Drummond, Muscle Shoals keyboardist Spooner Oldham and pianist Terry Young, and veteran drummer Jim Keltner. it’s no great mystery that when Bob Dylan seemed to find new faith around 1979, a lot of fans and Dylanologists lost theirs — in him. it seems clearer that another major impetus for him in heading down the path of spirituality had to be the opportunity to tap into the higher power of a great rock-gospel band. So what were audiences to think when, with the release of 1979’s “Slow Train Coming” album, he sang that he was “Gonna change my way of thinking / Make myself a different set of rules” and preached that “there’s only one authority / And that’s the authority on high”?. Roots music aficionado that he’s always been, Dylan has long understood the power gospel music has to move and inspire listeners. In turn, Bob Dylan served up some of his most impassioned, electrifying performances with these gospel-steeped songs. “Bob Dylan — Trouble No More — The Bootleg Series Vol. 13/ 1979-1981.” This one spans the so-called “Christian period” of his trio of albums: “Slow Train Coming,” “Saved” (from 1980) and “Shot of Love” (1981). Slow Train Coming was at least a challenging and engaging album, with much typical imagery and complexity. A stunning gospel version of the title track features in the current hit play Girl from the North Country at the Old Vic theatre. The follow-up album, though, 1980’s Saved was too close to pure gospel, too devotional, and alienated even more fans. Shot of Love in 1981 continued the religious theme to a degree, but it was intermingled with what one might term secular tracks, and there was evidence that Dylan was once again changing course. Filmed at Toronto’s Massey Hall and in Buffalo, New York, Dylan’s gospel shows have long been a bootlegger’s holy grail, and it was only on last autumn’s Trouble No More boxed set, the latest volume in the official Bootleg Series, that some of that footage finally found official release. Now that hour-long film has made it The nights of religious fervour and impassioned performances. It intersperses up-close and personal studio rehearsals with exceptionally intimate live footage of some of Dylan’s strongest Gospel songs – the likes of “Solid Rock”, “Slow Train”, “When He Returns” and “Precious Angel” – with slightly contrived but absorbing enough “sermons” written by Luc Sante and performed by Michael Shannon, who plays a lean, mean kind of preacher who wouldn’t be out of place in Girl from the North Country, the hit Dylan musical. The subjects for each “sermon” were apparently suggested by Dylan, but it seems the singer had no further part in shaping their texts. A shame. There was a bit of a disconnect between the tone of these spiritual homilies and the music itself, so intimately captured, and so strong and vivid an expression of Dylan’s spiritual journey at the time. It might have made more sense to, say, use Hank Williams’ Luke the Drifter song-sermons. It was material that certainly chimed with Dylan from an early age (“I could listen to the Luke the Drifter record all day and drift away myself, become totally convinced in the goodness of man…” he wrote in Chronicles). That force comes through as well in the best tracks of Bob Dylan’s Trouble No More – The Bootleg Series Vol 13 1979-81, the concert chronicle of his much-maligned “Christian” albums. The fiery gospel fervour delivered here benefits a great deal from being live rather than reproduced in the studio. These two discs are dynamite, containing, I am sure, some of the very most stirring moments of Dylan’s gigantic opus. In tracks like “Solid Rock” from San Diego in 1979, you can feel his heart bursting with religious passion, and everyone else – from the tightest of bands to five red-hot back-up singers – possessed by the spirit. This combination of note-perfect excellence and total letting-go can only be good for the soul, Dylan’s own, but for us the audience as well. The deluxe set from Columbia Records/Legacy Recordings encompasses eight CDs and one DVD with director Jennifer Lebeau’s new documentary, “Trouble No More: A Musical Film.” An abridged two-CD set and a four-LP vinyl version are also available. Discs 1 through 4 are framed smartly, each of the four opening with markedly different renditions of the same song: “Slow Train Coming,” displaying how Dylan’s restless artistry was always in search of the right feel, tempo and attitude for a given song. An alternate studio take of one of the “Slow Train Coming” album’s higher profile songs, “Gotta Serve Somebody,” features a livelier bounce in the rhythm section of Drummond and drummer Pick Withers, while keyboardist Barry Beckett pushes the song forward with beat-anticipating piano interlaced with funky clavinet parts. The backing gospel singers on the released version are absent. The fidelity of the live versions varies noticeably in places, which makes for some compromises. The performance of “Man Gave Names to All the Animals” on the first disc, recorded in 1980 in Portland, Ore., benefits from a more fluid reggae-ized lilt by the band, and is buoyed further by a break where the gospel singers are featured. But Dylan’s vocal is low in the mix, rendering certain lines difficult to discern, especially to anyone not already intimately familiar with his clever roster of creation stories he cooked up for so many critters.